When I visited my parents in New Orleans this past week, I wanted to showcase some of my favorite things that I learned at the ICC. After working at L’Ecole, the fancy pants restaurant where the students work in levels 5 and 6, I absolutely fell in love with duck. I’m not really a big meat eater at all, particularly steak (I hate steak), so the fact that I freakin’ love duck is a pretty big deal. The first time I tasted it for real was when I was making a demo plate before service (I know I made it once in level 2, but I have no recollection of it, so I must not have made it correctly). I literally took a bite and started looking around the room trying to make eye contact with people – like WHAAAAT is this??? Have all y’all had duck? who’s with me – this is out of control! anyone, anyone? Clearly I was on my own with this new discovery, but I was still very impressed regardless. 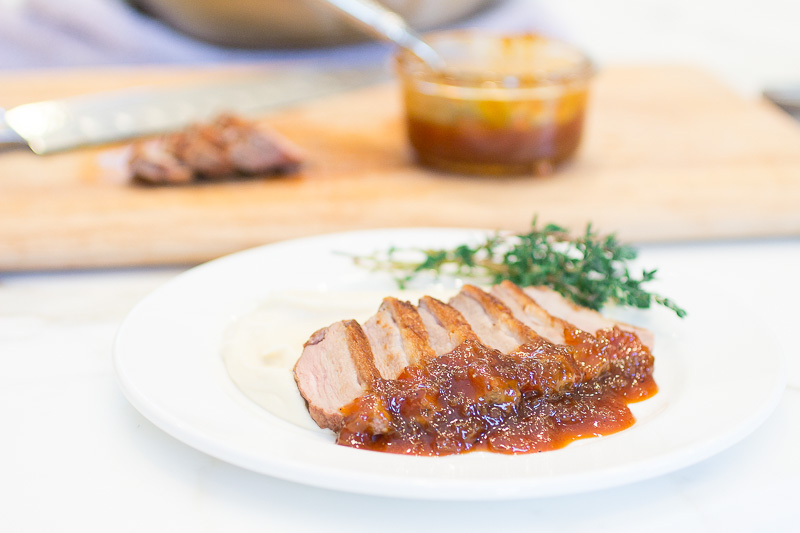 Thus, I decided to make duck with duck sauce, cauliflower puree, and sweet potato pommel paille (which I didn’t make for this post, but it’s ultimately super thinly cut and fried sweet potatoes. They are super crunchy and taste out of control with the cauliflower puree). This most delicious meal in the world and if I’m ever trying to impress someone, I’m gonna make this FO SHO. These pictures depict how the breast shrinks and the fat renders over time. This is too much salt for one breast, but I only did one as an example. Normally you would cook two in the same pan. 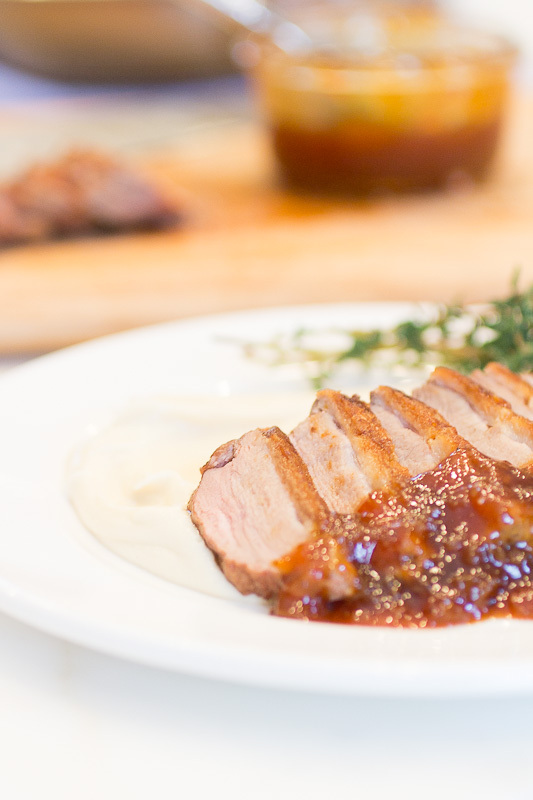 If you have ever butchered your own chicken, then a duck should be pretty simple to master. The only difference is the way you remove the breasts. I thought this video was a nice refresher. I also liked this one because the man in the video sounds exactly like my instructors did in school. (In the first video he does not remove the wish bone and in the second he does. I learned it the second way, but some say leaving the bone in acts as a guide for removing the breasts, so it’s really up to you). 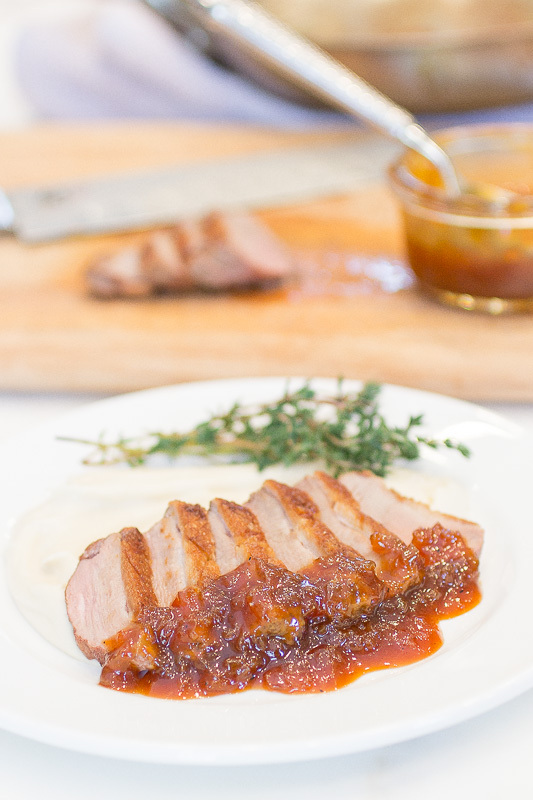 Also KEEP YOUR FAT because it’s easy to render and you can use it for so many things, particularly duck confit. Watch this video to see how it’s done. It also smells freakin’ define! Add the chopped carrots, onions and celery and sauté until golden brown. Deglaze the bottom of the pan with white wine and scrape the sucs (crispy bits) off the bottom of the pot and reduce the wine until almost dry. Stir in the tomato paste and cook for one to two minutes more. Add the crushed garlic, thyme, peppercorns, parsley stems (if available) and chopped tomatoes. Add enough water to completely cover the bones. Cook for about 45 minutes to an hour, or until fully flavored. In a large sauté pan over medium heat, sweat the shallots in about 2 T of butter until translucent. Add the Mirin and orange juice and reduce to ⅓. Add the duck stock and reduce until the sauce substantially and has become very thick and dark in color. This can take about 30 minutes to an hour. Remove the leaves and stems from the cauliflower and chop into small pieces. Cook over very low heat until the cauliflower is incredibly tender. Stir occasionally to prevent browning. You want the cauliflower to be as white as possible. Pour the cooked cauliflower into a high-powered blender and add the heavy cream. 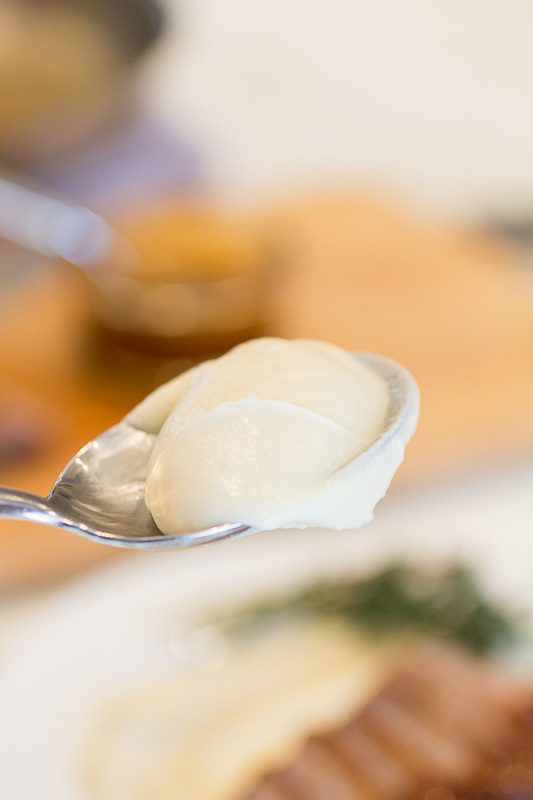 Puree on the highest setting until completely smooth. Add more heavy cream if need be. 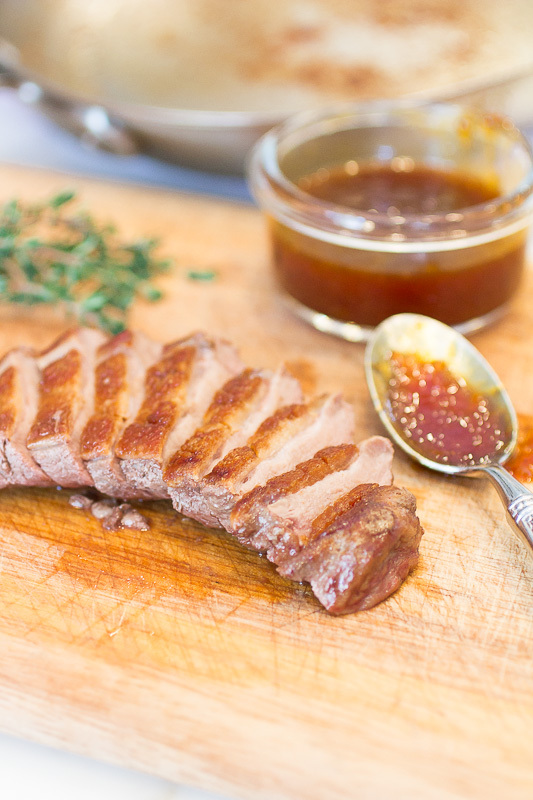 To prepare the duck, cut in a crisscross pattern along the skin side of the breast. Be sure to cut all the way through the skin but not through the breast itself. This allows the fat beneath the skin to render without cooking the actual meat. 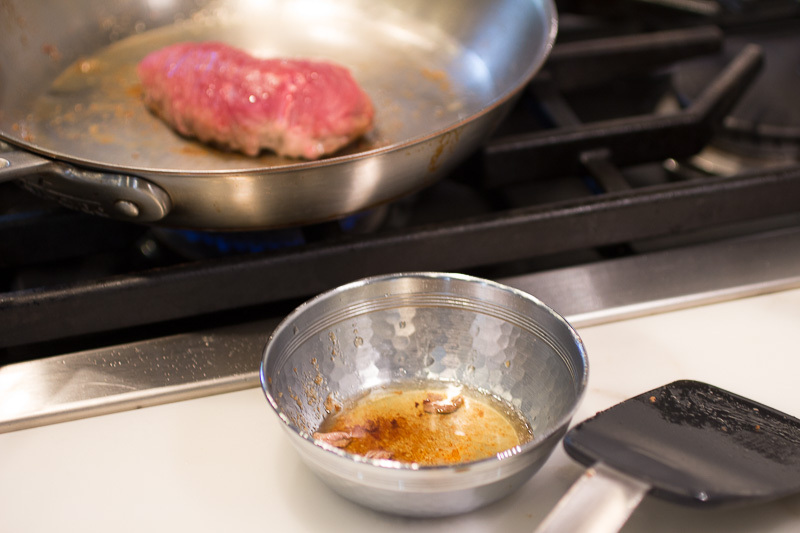 Heat a medium sauté pan until very hot. 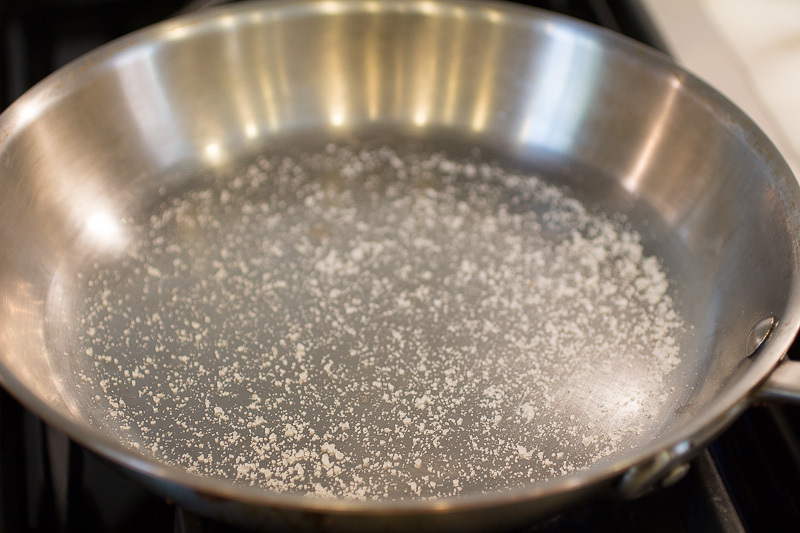 Sprinkle a thin layer of salt on the bottom of the pan. 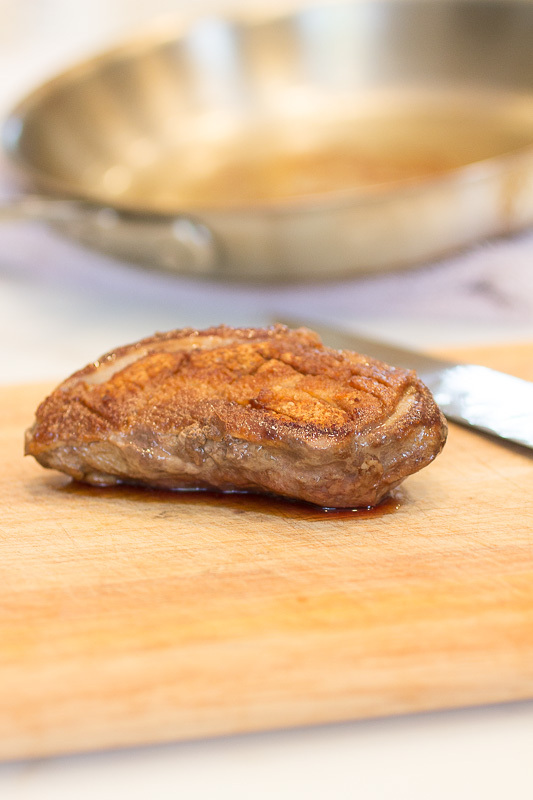 Dry off the duck breasts as much as possible, and then gently place them in the pan skin-side down. 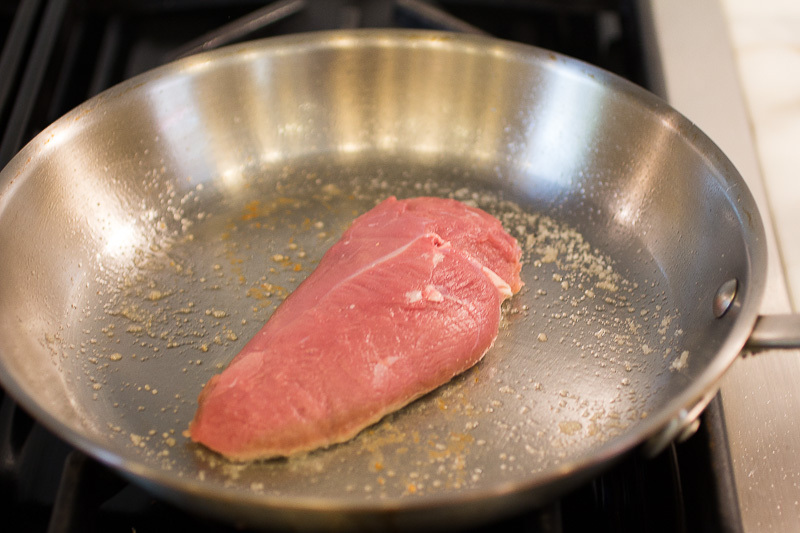 If you do not hear cracks and pops as the breast touches the pan, it is not hot enough. 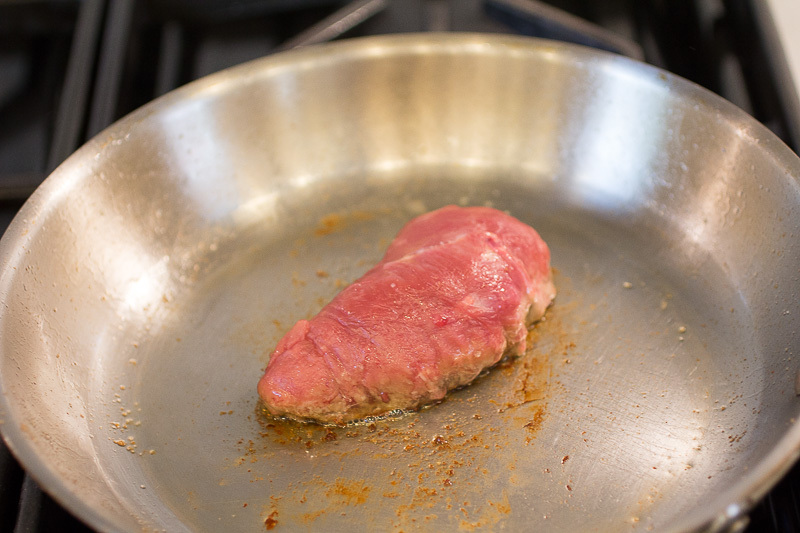 Immediately after placing the breasts in the pan, reduce the flame to a very low simmer. 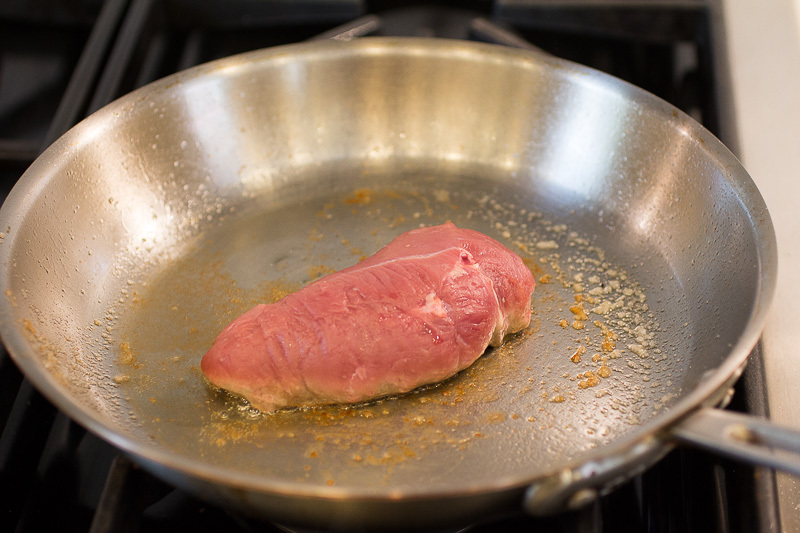 If you gently shake the pan, the breasts should no longer stick. During this time, preheat the oven to 500 F.
This process can take from 45 minutes to 2 hours if done correctly. 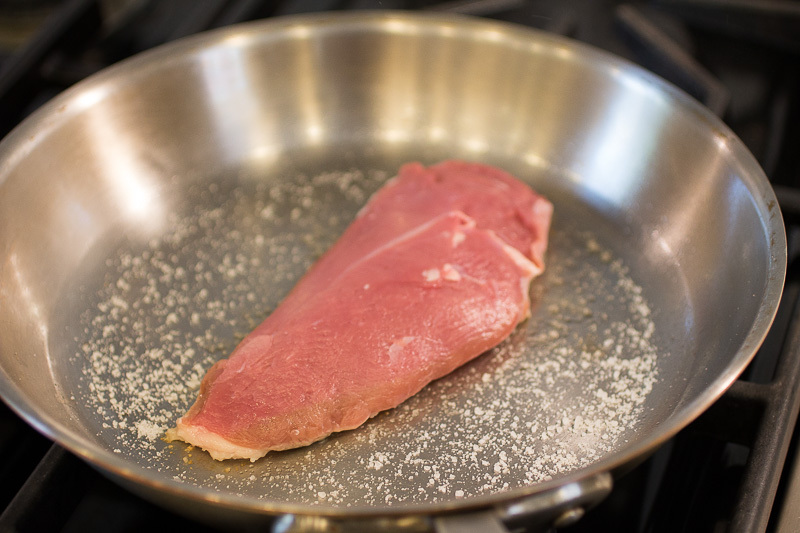 Depending on how long the fat has been rendering in the skillet and how well you like your meat cooked, you could either flip the breast briefly and then remove it from the pan and let it rest, or you can finish it off in the oven. This is unreadable. Tiny gray text on a white background? Use higher contrast and we might see what you are saying. Also, rather idiotically your site asks whether I want to like the post, before I can even read the damn thing! The pop up is asking you if you would like to follow on Facebook, not like the post. If the font is too small for you, you can zoom in at the top of your browser. Have a nice day.